In the first passage (Luke 20:1-8), the chief priests, scribes and elders questioned Jesus about the authority with which he was acting. They were baiting him into what they presumed would be blasphemy, but Jesus would not bite. He would not lower himself to engage in a war of words. Oh, he could have…He knew the truth. He could have justified hammering them with that truth. He could have convinced himself that he was not afraid of the gospel and that it was time to take a stand for truth. He could have used pretty much any of the excuses we use today to blast our culture with “the truth”. But he sidestepped the entire engagement. He modeled restraint and held his tongue, even on a hot topic such as his spiritual authority in this world. Sometimes, we are much better off in today’s culture showing some restraint and biting our tongues as well. In the second passage (Luke 20:19-26), the chief priests and scribes got more creative, sending spies to do their dirty work. These spies asked seemingly innocent questions fed to them by the scribes and designed to trip Jesus up…in this instance, questions about his views on politics (governmental authority and taxes). Again, he sidestepped the argument with a simple truism: if it belongs to Caesar, then give it to him…if it belongs to God, then give to him. No opinions here about whether it actually does belong to Caesar…no public statements about what a buffoon Caesar really is…no facebook posts ridiculing Caesar and the entire Roman occupation as a violation of human rights…none of that at all. Again, he modeled restraint. And so should we, as the church. Jesus had all the authority of Heaven with him, and nobody has ever (or will ever) have more truth on his side than Jesus did. And he showed unbelievable discernment on the issue of when to speak and when to stay quiet. As the body of Christ, shouldn’t we do the same? In representing the authority of Christ on earth, shouldn’t God’s people be just as discerning in how we use our words? 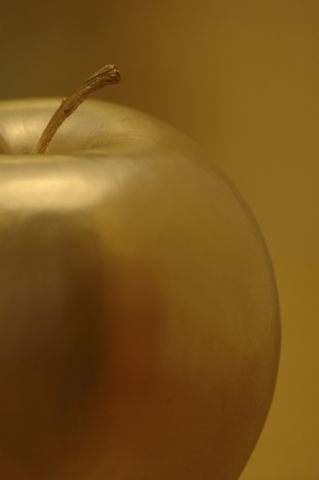 Apples of gold, my friends…apples of gold.